This board was manufactured by Intel and IDT and used over about a two year period on a variety of 486 systems using a 33Mhz bus in the early nineties. 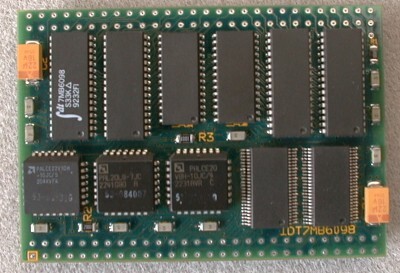 The board contains a total of 4 rows of 28 pins. The 3350 has 4 drive bays. Two are external (the top external bay can hold a 5 1/4" device like a CDROM drive). The other bays are for 3 1/2" devices only. In order to get the fourth bay (the "upper" "rear" bay, two sheet metal extenders are installed above bay three (bay three is the "lower" "rear" bay). If bay four is used, you cannot use the upper front bay for a 5 1/4" device (there is not enough room). 4 MCA slots. One is an MCA video slot, and has the extra connector for the Clarity 1 card. NCR 77C22E. with 1MB of video ram. Capable of 1024X768 256 colors. There was an optional video board built specifically for the 3350 called the "Clarity 1". It plugged into a proprietary slot, and was capable of up to 1280x1024. The Clarity 1 has 2 MB. The feature/kit number for the clarity 1 is 3350-F/K256. > I have a NCR 3350 with a Clarity I video card. Does anyone know if there are Win95 drivers available for this card? Or even who manufactured the Clarity I card for NCR? > MCNCR designed and manufactured the Clarity I card in-house. I was project leader and developer for the Windows 3.1 & NT device drivers for this card. I also worked on testing the existing 3.1 drivers under Win95. They appeared to work fine. I believe that the official position of NCR is that this card is not supported under Win95, but I'm not sure. However, we did get the drivers working both by upgrading and existing Win3.1 installation and installing under Win95. No mods were made to the drivers. These two statements must be added to the CONFIG.SYS file in the following order - following any memory manager drivers (such as HIMEM.SYS or EMM386.SYS) and must precede any other "DEVICE=" statements. Another good utility to download from NCR is PUTSIG which will fix a Reference Disk that's been corrupted by WIN 95.